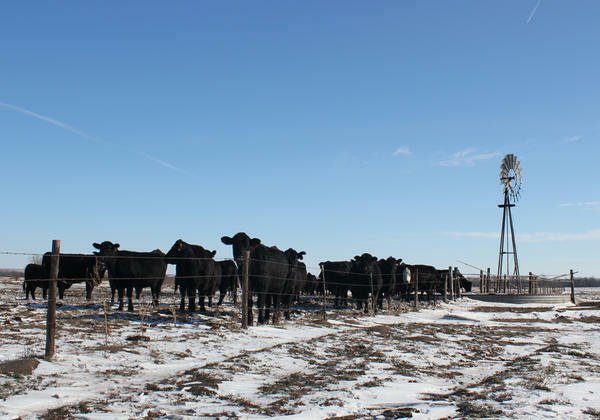 Cattle gather for a drink on a ranch in Nebraska. 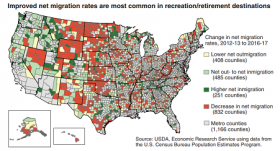 Rural Midwestern counties continue to lose people, and are getting older. John Cromertie, one of the USDA report’s lead authors, said these things are connected. With some rural communities, he said, folks are aging in place while younger people keep leavinga. Fewer people means fewer jobs to keep other young people around. And to top it off, there’s a shrinking labor pool as residents retire, making it difficult to attract new businesses. Cromertie pointed out that rural populations are also stagnating because of lower birth rates and more people dying from the opioid crisis. “So future growth will rely more and more on positive net migration — on more people moving into areas than moving out,” he said. The report showed rural employment rates are inching up at about half a percent a year, though they’re still 1.8 percent below pre-recession levels. For comparison, urban-area employment rates are 8.2 percent above pre-recession levels. “It’s during periods of recovery where rural areas tend to lag behind metro areas, and I’m afraid I don’t have a good explanation for why that would be,” Cromertie said Thursday, responding to a question during a call with reporters. The USDA also says poverty is declining in rural America, dropping from a 30-year high of 18.4 percent in 2013 to 16.4 percent. Still, that’s higher than in urban areas, where 12.9 percent of the population is poor. Rural poverty disproportionately affects black citizens, which represent 8 percent in the entire rural population but make up 17 percent of rural poverty. Those poverty rates did fall significantly since 2013, though, from 37.3 percent to 32 percent.